Jota Chatter Increasing – Will We See A Spanish Return? The chatter surrounding the possible return of the mercurial talent that is José Ignacio Peleteiro Ramallo seems to be growing, with reports in both the Spanish and West London press suggesting that Brentford FC are considering bringing back Jota to Griffin Park. 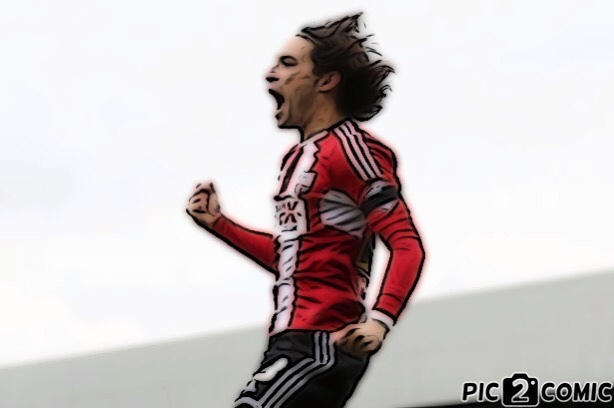 Bees fans still wax lyrical about Jota’s performances in our never-to-be-forgotten first season back in the Championship, and his last minute goals against Fulham have cat his name firmly in Brentford folklore. However, because of certain domestic issues at the time his wife was expecting their first child, and some indifferent form and injuries at the start of the 2015/16 season, it was decided that a loan deal back to SD Eibar was in the player’s best interest in the short term. Many fans have been confused by the deal, which was hoped to allow him to regain his best form in familiar surroundings, and ultimately, would perhaps see Brentford see a reward for one of the best signings in the club’s post-War history. On his day Jota is a £5m-plus rated player – surely the club can’t afford to let that talent and possible income whither away. The wise move now, having seen the Eibar deal fail, is to get him back to Brentford and try and get him integrated back in the Bees squad and focused on resurrecting his career. We spoke about the return of Jota in this week’s Beesotted Pride of West London Podcast that can be listened to here. In my view, Brentford have been very understanding with the player’s wellbeing and have put the individual ahead of the club’s best interests – something that the player acknowledged in his ‘leaving’ statement last year… But my gut feeling is that, if there is even the remotest chance of getting some creative Championship minutes out of him in the remainder of the season, then seeing where that leads, we should get him on a plane back to Heathrow pronto. It would be such a tragedy if Jota ends up on the scrap heap, and although there are no guarantees at all if he were to come back to the Bees, its got to be worth trying, and you ever know, we may see him in a red and white shirt again some time soon. PreviousBirmingham preview: Who is going to end up singing the Blues? Totally agree Dave and although there is a risk his form isn’t at a level that would see him perform to the level he did before a return of any sort would benefit both him, the club and the fans. I can only imagine how it would boost his confidence when the cheers ring out around Griffin Park and his name sang out just when the team is announced let alone when he steps on the field of play. I would suspect it would visibly boost him. Secondly the club would be getting the equivalent of a new signing similarly to when Lewis Andrea and Scotty all returned from their injuries. It would also just give us an attacking player who likes to run with the ball, take on a man and have a pop at goal something sorely missing. Lastly the fans the obvious boost it gives us all that he may grace the shirt again would be excellent along with just a hope he can reproduce the form of old. Sadly it maybe we the fans may need that boost as we need to prepare for a possible loss of Scotty and Judgey in January and as you forecasted with little being spent in January we will need a hero to cling with to! I think that the Spaniard, showed a really confused set of values, when he seems to have put a domestic situation, before club and football, his craft and profession. Domestics resolve themselves, usually, but his drastic departure seriously damaged the BFC team structure and this has contributed to the serious lack of consistency thus season. I am guessing, that the developing problems at BFC, including doubts regarding the abilities of manager Smith, are more profound now, which will be unlikely to be resolved by the Spaniards’ return or not. Gloomzone at 16th and the Doomzone is at nigh. And your revelling in it aren’t you, some Supporter you are Boru. By the way your rhetoric seems familiar to someone from last season? Why are you talking in such a paranoid and nasty manner, “hobo”; I ask you, to learn to debate, in a reasonable manner and stop being so aggressive. Really, what a small mind, what petty concerns dominate your life! Nom de plume, you are aka “NB”, ha ha! You are wheeled out as the mr nasty, to respond to any opinions contrary to “el wimpo”.